Wearable tech: Where do we draw the line? Wearable tech is back in the forefront with the release of the Apple Watch. Apple’s entrant is sure to help the sector overall, with expectations of tens if not hundreds of millions of devices to ship annually from Apple and others by the end of the decade. This success does not come without its share of questions, however. Unlike our cell phones, tablets, and video game consoles, this new class of devices are different. For a lack of a better way to say it, they are a part of you. Its use carries significant societal and moral implications. Those issues came to my mind after reading a recent piece by my colleague Joe Wilcox. In it, he spoke of comparing the Apple Watch with Google Glass. I do agree with him on his central argument of innovation: Google Glass is far more innovative than Apple Watch in several respects. I think he misses a bigger question, however: which device has a greater societal impact? And how will it affect us? You can think of wearable technology as coming in two flavors: intrusive and non-intrusive. Non-intrusive wearable technologies follow the same patterns of your typical smart device: it’s complementary, dismissible, and secondary to how we interact. Apple Watch is a perfect example here. You’re not connected to it at all times. Google Glass is different. Its use is intrusive. Wearers live in augmented reality. Looking at the sky gives you the weather. Walking or driving down the street, directions where you’re heading appear in your field of view. A near never-ending stream of information bombards our senses. It’s more supplementary than complementary. Data is persistent rather than dismissible. In many cases, the data becomes central to how we interact with each other and objects around us. Modern society is already attached too much to our digital devices as it is, and intrusive wearable technologies exacerbate the problem. Is your Google Glass-wearing friend really listening to you, or is he checking the latest Yankees score? That lady in front you on the Capital Beltway: is she paying more attention to the roadway and those cars in front of her, or the directions in her field of view? You can argue that this is just a distraction rather than a complement. These issues and the entire concept of the extent technology will take over our everyday life is probably one of the great technological riddles of this century. Are we really ready to put another barrier up to human-to-human interaction? Innovation isn’t everything. Consumers and the technology manufacturers alike must remain cognizant of the implications of wearable tech at every turn. 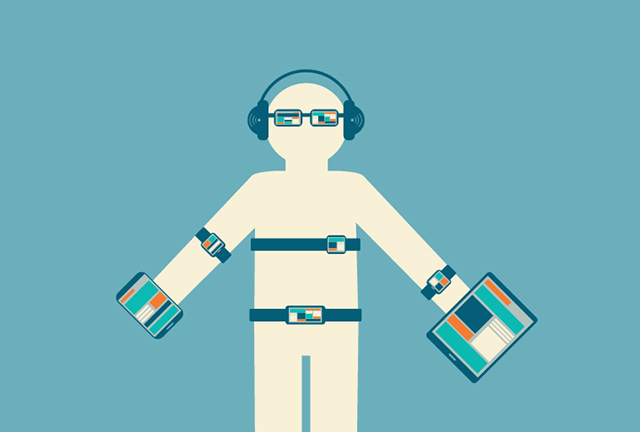 Do intrusive wearable technologies have their place? They certainly do, but society as a whole must decide if it really has a place in everyday life. I’m interested to hear the community’s opinions on the implications of wearable tech. What do you think? Is there a line society is about to cross that may be a step too far? Let me know here in the comments.